Making a DIY Centerpiece is super easy with spray paint and pine cones! So if you need a last minute way to make a glittery decoration to celebrate New Years, grab some paint and pine cones and in less than 30 minutes you will have a fabulous DIY centerpiece! You might also like these DIY wood candle holders. Lowe’s has everything you need, including the pine cones. Place pine cones in a box to contain the spray paint and make for easier clean-up. Give pine cones a coat of metallic spray paint. 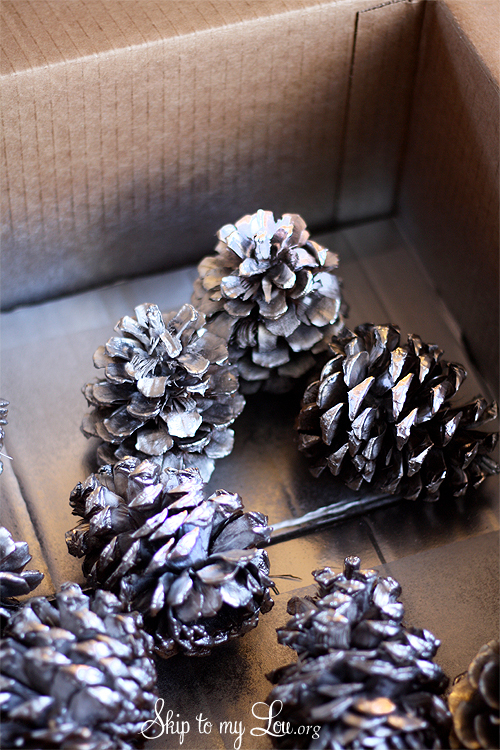 Once the metallic paint is completely dry give the pine cones a spray of glitter. 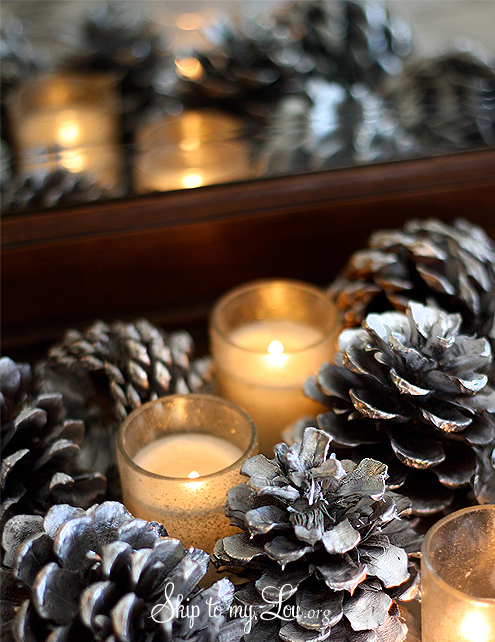 Set some glass votive candles amongst the pine cones and you have a quick, easy and beautiful centerpiece! Lowe’s has all the tools you need to be creative. Check out their Lowe’s Creative Ideas blog and be inspired! You can find Lowe’s Creative Ideas on Facebook and don’t forget to pick up a FREE Subscription to Lowe’s Creative Ideas Magazine. Their magazine is fabulous! 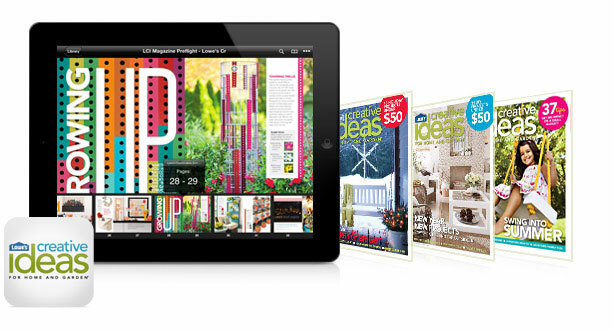 Or, now available for the iPad, the FREE Lowe’s Creative Ideas App gives you full access to the most recent magazine issues. Get all the exciting project ideas, helpful videos and loads of bonus content wherever you go! Disclosure: Lowe’s gave me a gift card to cover my supplies! All ideas and opinions are my own. Lowe’s truly is my go to place for supplies! Contest will end Jan 6 at 12am central time. Winner will be chosen by random.org and will have 3 days to respond via email. Lowes and Cindy Hopper are not responsible for lost of undelivered emails. Your chance of winning is determined by the number of entries. All entries must be in the United States only. How very cute and festive. I wish I was this creative! Cute! I love making centerpieces opposed to buying them. Way cheaper too! Love Lowes. We are there at least twice a week for DIY projects. Employees are always so helpful and friendly. Thanks for the ret giveaway. What a great giveaway! I love Lowes! So pretty! Would love to do this next year! I love to create things! I would love to win this giveaway! I love buying craft supplies at Lowes. I don't feel the need to explain my purchases. These pinecones are the perfect idea for a winter wedding shower I'm hosting later this month. Thanks! I cannot wait to do new projects in 2013. You are so crafty with things even from Lowe's! I'd be excited to win! I have tons of pinecones. They look so pretty with just a little metallic paint. Thanks for the giveaway! what a great and easy idea for ALL thos epinecones in our yard! What a cute idea. I want to do this next year. So pretty! And thanks for the chance! Oh, what a gorgeous centerpiece! And what a generous giveaway! My only question is ... wouldn't the spray paint make the pine cones even more flammable than they naturally are? Or am I being a worrywart? Regardless, the effect is beautiful and I would love to win this giveaway. Thanks for the opportunity! Wow. Love the centerpiece. Thanks for chance to win. Great centerpiece idea - love it for the winter tablescape! This would be great! Thanks for the giveaway! I love Lowe's. Seriously. We are building a house so we are there several times a week! Love this idea! Thanks. Always creative. Would love to win this as we have several projects lines up. I love Lowes and its amazing all the wonderful crafty stuff you can do with stuff bought there! This centerpiece is fantastic! Thanks for the chance to win!! Oh Man! And I just passed up clearance pine cones cause I hadn't a clue what to do with them! I would love to win this! Thanks so much for the chance. What a cute simple idea that looks so pretty. Wow, I love shiney things! Just lovely. I love this centerpiece! I struggle to find ways to decorate throughout winter once I've taken down the Christmas decorations. This is beautiful! Great giveaway!!! Everyone loves Lowes! Love all the Lowes ideas. We buy all our paint (and so much more) from Lowes. Just moved and need to buy more for new house and the gift card would help! This centerpiece could be used for many different winter occasions! Wonderful ideas! So pretty! My coffee table always needs a little something, this is perfect all winter long. P.S. Thanks for the giveaway! Love collecting pinecones whenever I visit the mainland. Mahalo for the fabulous idea. Thanks for the giveaway!! I've been searching for a bowling pin set I saw someplace on line in a Lowe's article. The Lions Club in Tecumseh, Michigan has the sight mobile at our Appleumpkin festival in October & we have pumpkin bowling. I thought that the bowling pins made from pvc pipe would be grand & hold up to the pumpkins hitting them & survive for years to come. Can you help me by sending me the information?? The gift card sure would be great to win to cover the cost & repaint our bowling "alley" to set the pvc pins up on!!! Thanks a million & then some! What a neat idea! And so cute, too. And easy. Thanks. Great post! Reminded me that I've been wanting to paint some pine cones in pretty metallics to use as decorations for the Christmas tree next year - can't go wrong with nature + bling! This is a great giveaway - thanks! Now why didn't I think of that? My daughter wanted everything red, green and silver this year. I'll have to remember it for next year. Ooooohhh....a Gift Card to Lowe's is a super prize! If I won, I'd use it to purchase paint for my daughter's room. Thanks for this chance to win. What a Cooool & fun idea! I <3 Lowe's Creative Ideas magazine. I've been a subscribe for a few years now. So many great ideas! Love shopping at Lowe's with my hubby. Daddy needs some new tools!! Thanks for the chance to win and the easy crafty idea! I have a fundraiser in February for foster youth where I have to put a table together...the pinecone idea is such a great one! I'd love to put a Lowe's card to good use! What a great idea with a great giveaway. Thanks for the opportunity to win. Those are SO cute, love the idea. Thanks for the fun giveaway! What a fun centerpiece. Thanks for the giveaway. I love Lowes! Great to get my husband to get things done around the house and I find things there to craft with! My husband and I LOVE Lowe's! It's our favorite store. We were just at Lowes last night. I actually bought spray paint lol! Now I have to go back and look at the metallic and glitter paints because I have a pile of pine cones from Mr. B's parents place! Lowes gift card for Christmas - fingers crossed!!!!! Your centerpiece turned out nice. Very pretty! This is quick and easy. I have made these as tree ornaments at school. You can use glitter, too. 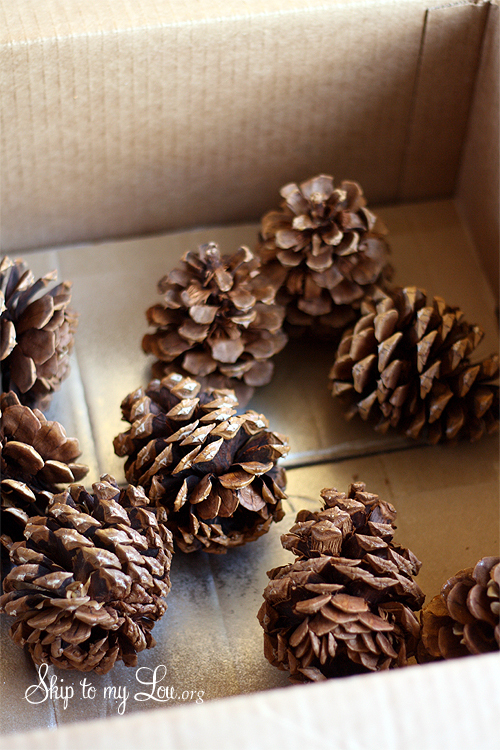 If you have a bowl of these pinecones, add some mini ball ornaments and/or lights. They look great in a clear glass bowl. I would never thought to head to Lowe's to get "craft" supplies for a centerpiece! It's beautiful!! Lowes is a great goto store! I love Lowe's!! Every time we go it seems like we find something we haven't seen before. Their associates are awesome!! Great post. Would love to win the gift card...Lowe's and I spend lots of time together. I love your centerpiece! So cute! I love Lowe's! I'm in the process of redecorating my family room and am planning to repaint some furniture and buy new drapes there-- I'd love to win this gift card to help with that! I have so many house projects to tackle in 2013. Thanks for the chance to win! Perfect! I have bags of pinecones awaiting a project :) Lowes here I come!! Love lowe's! Lowe's gift cards tops my wish list every year! Love Lowe's! Would love the giftcard! lovely centerpiece. i love lowes my favorite place to shop for craft supplies and tools. Thanks for the great centerpiece idea! I am trying to turn a dingy basement into a chic apartment. A Lowe's card would help a lot! Love the pinecones! Lowe's is my home away from home... would love to win a gift card! I love Lowe's creative- great DIY projects. Power tools, craft supplies, and great ideas. Lowe's=Fabulous. I love you DIY centerpiece with Lowes supplies. You always inspire me to do soemthing. I love Lowes Creative Ideas magazine! It's always full of great ideas. No matter what the occasion - I can find it there! last minute gifts, decorating items- or I have to be creative with what I find to decorate, party ideas and goodies, and always.... items for my classroom! Love shopping at Lowe's and am so impressed with their kids workshops. A gift card would be nice! I love this centerpiece! I am having a fall wedding in Asheville and I may think of this as one of my ideas for the reception centerpiece. It is a September wedding. I think it could work! It seems like I'm at Lowes every week! Thanks for the giveaway. The nearest Lowe's from our home is 90 miles away but when we are in the area, we do shop at Lowe's. Nice to have such a variety of items in one store. Great giveaway and project! We love Lowe's--just went there today, actually! My husband and I tell people all the time that LOWES is one of our favorite places to go for a date!! We both have a LOWES Wish List!! what a simple but great idea! Lowes is one of my favorite stores! 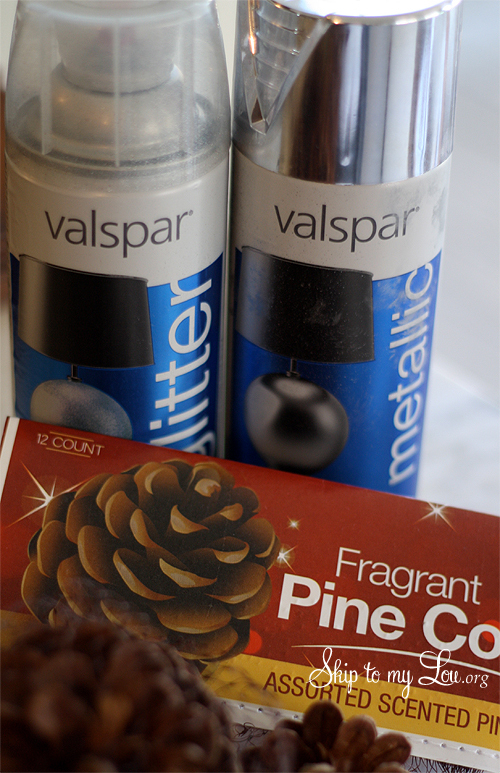 Didnt realize valspar had glitter spray paint and I'm always in Lowes. How did I over look this. Thanks for the post! A great idea and so easy, too! Thanks for the giveaway!!! Love Valspar spray paint. Used the Valspar primer on a old chair I painted. This would come in handy as a kick start to some household projects that must be worked on around here! you had me at spray paint LOL, pretty project! Keep em coming! This is one fantastic giveaway! Oh the projects we will do in 2013!!! My husband and I built a desk and would like to build a matching coffee table. BTW-your pinecone project is brilliant. Easy and simple, yet elegant. Thank you! I'd love to use it on new year's home project. Beautiful Pinecones. I think I need to make some of these for my library display counter. Those are so pretty - but it's way too cold for spray painting here! I am already collecting a number of projects and supplies to be ready for the 'first warm day' - no looking forward to Spring for me - just 'spray paint weather'! I would love to win - I NEED some of that wonderful paintable beadboard wallpaper! Love this. I already have the pinecones. I would so love to have a gift card from Lowes. We go there all the time, and always need something for the house. Thanks for this chance, and thanks for sharing your painted pinecone idea! LOVE it!! Simple, quick, low cost ideas....is how I roll. I LOVE Lowes!! We are completing a lot of home projects this winter, such as painting, and installing shelves. Thanks for the giveaway! Lowe's is our go-to hardware store and I love their Creative Ideas magazine. The silver pine cone wreath is beautiful! Thanks for sharing. you always have such great ideas. great giveaway, thanks for the opportunity. I would love to win this one - My daughter and I have been eyeing a "glass cutting kit" at Lowe's for some time. It would be nice to treat ourselves! I look forward to the Lowes Creative Ideas Magazine to come every couple months. You are right, it is fabulous. Would love to win a gift card to get some things donw around the house and do some of the creative Lowes ideas. Thanks for the giveaway. I love Lowes Creative Ideas, glad to see it is an app for the ipad!! Santa gave me a Kindle Fire so I will be sure to download the Lowe's app. Would love to win and re-paint my living room!! I find myself gravitating towards Lowe's more and more for my crafty supplies! Thanks for the chance to win! I have made so many projects from Lowes Creative Ideas. Quick and easy. I'd love to win the givaway. Love your projects and LOVE Lowe's...,.it is our, "go to," store for home improvements and we always seem to need something from there! Love Lowes. Looking ahead to Valentines Day I want to get some tiles and try making photo coasters with them among other things. Such a nice giveaway- we love Lowe's -we have an old house and they usually have what we need! Love bringing the outdoors in for decorating. So cute! Great idea. I enjoy making my own centerpieces. Thanks for the chance to win the giveaway. I love that glitter paint. The pinecones look so expensive! Thanks for sharing and for a fun giveaway! Cool centerpiece, thanks for the chance to win. I need to do some home improvements, DEARLY. This would be a blessing-- I love Lowes! Love this! I even have some extra pinecones and silver paint. Going to give it a shot right now. Awesome idea to spray in the box - I always forget that when worrying about spraying in the wintertime when I have to be inside. Thanks for the giveaway! There are so many projects I want to do. My husband and I recently sat down and made a DIY wish list! It was so fun. We just need to pick our first project to tackle. Wow I didn't know they had a creative blog. I'll have to check it out! Thanks for the giveaway. Love the centerpieces. Thanks for a quick and creative idea. Love Loews Magazines. Such a fun giveaway! We love Lowes. I never thought to use a box for my spray painting. Ususally I spread newspaperr outside but it is still messy and now that it is cold outside is nearly impossible. So glad you suggested it. I love your centerpiece. so easy & elegant. Thanks for the idea. I'm going to switch out my Christmas mantel decorations with this great winter decor! What a wonderful idea!! I have been killing myself trying to come up with something for all the pinecones we collected this year. Thank you for the inspiration! Love Lowe's &I doing projects! Thank you for the giveaway. We love to shop at Lowe's. Such a lovely project! Love Lowe’s! Please enter me in this contest! Thank you for the chance to win. Great idea! Natural but elegant. Fun giveaway. A Lowe's giftcard would be awesome. Love this idea! So elegant and perfect for the New Year! Thanks for the giveaway, we just took in our three nieces and nephews and we could use this to make more storage options. What a simple and elegant idea! Moving into our new custom built house in May of 2012. I have so many decorating projects planned! I'm in the process of buying a new home right and just signed up for the Creative Ideas magazine. Can't wait to get it! Your centerpiece is gorgeous..I would love to make one!!! Thanks to you and Lowe's for the chance to win! I got a miter saw for Christmas and am itching to try it (I think everyone is getting picture frames for their birthdays this year :) ), so I'd love to pick up some decorative trim pieces and some lumber. I've got a ton of ideas piled up! Lowe's alway has great ideas in their Creative Ideas magazine and blog!! Love them!! I love how easy and elegant this is. Very doable for busy mom's! What a lovely centerpiece! I would have no problem coming up with a project to do with the gift card! We've been spending a lot of time in Lowe's lately because of do-it-yourself renovation projects. I really like the stores - and pinecones. A great combination! What a great idea to put pine cones in a box to spray paint them! 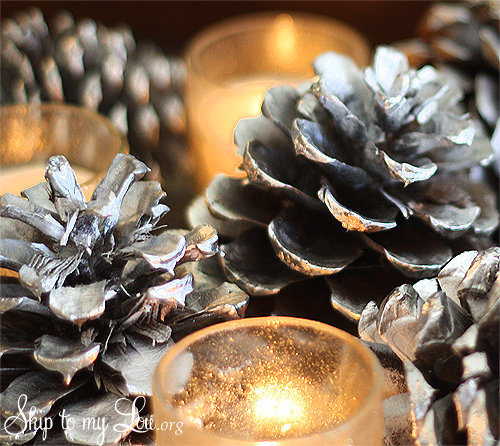 I absolutely adore silver, glittered cinnamon pine cones! I like to have a basket of them w/ greenery & pointsettias next to the fireplace! Such a nice scent & easy on the eyes!! Thanks for the opportunity to snag a GC to Lowe's! We love it there!! I have a list of things I need for my new house. In fact I'm going there today to look at some things. Love the centerpiece. I may make it. Beautiful centerpiece, wow has spray paint come a long way!!! Happy New Year to you and yours. Thanks for the chance to win this gift card. Lowe's rocks! We are currently remodeling our kitchen. I would love to win to help with that! Great project and great giveaway! Thank you! Neat! And so quick & easy. Thanks for the idea. GLITTER SPRAY?!!! Oh my! My heart is fluttering! Where have I been? I'd LOVE to win a Lowes Gift Card! I love Lowes! It's my go to place for a lot of things. What an opportunity to win a gift card! A gift card from Lowe's would be fabulous! The only problem would be choosing what to do first! I love buying new paint for furniture and I need some new hardware for my kitchen too. I love lowes! They always have lots of choices. Love Lowes! My go to home improvement store! Super cute! We use Lowes and their Lowes card to track all the paint in our house. Boy, do we need some more paint! I love this!! Lowes is one of my favorite stores. Love the smell when I walk in! We are at Lowes at least twice a month, love them! for all those last minute emergencies especially those like this gorgeous arrangement go to Lowes. Great giveaway. Thanks for offering the chance to win. We love Lowe's! Love to go to Lowes and just to look to see what I can find. Love the centerpiece also!! I love to shop at Loxes as much as my husband! So simple, however very beautiful. Love the centerpiece! I see that the pinecones at Lowe's are scented!! Will definitely check it out! Painted pinecones, what a simple idea! It would be fun to spend $75 at Lowe's! I would love to try this project! Between my husband and I, we probably go to Lowe's as frequently as the grocery store. Love that place! Great giveaway! Thank you! Pretty pinecones! I would love a gift card to help me spruce up a room in my house. Heading to Lowes today to get grout for bathroom tile remodel. I will have to get some silver and glitter spray paint! Love how the pine ones turned out! Love Lowes as well! Very pretty. I live in wisonsin so pine cones are plentiful (thank you Mother Nature) but will get the other supplies at my absolute favorite home improvement store.....LOWE'S!! Thank you for sharing this. I have so many things from Lowe's I want for my new house!! Thanks for the giveaway! Thanks for the chance to win a card to my favorite place!! I love Lowe's! Great giveaway! I love your projects and would love a gift card too. Just imagine all the projects that can be done. Oh my - my Lowe's list is growing and growing with projects for the new year!! Would love a gift card!! Oh the things I could make with $75 to spend at Lowe's. Love that place!!! lowes is right down the street! thanks to lowes for honoring our vets! Love it and love Lowes! Cute idea! I wonder if they have pine cones year round or just during the holidays? I would love a gift card from Lowes. I love Lowes! I have a bag of the cinnamon scented cones from Joanns left from Christmas and I think I need some spray paint now! I loved this idea and it's going to look so pretty on the table. Thank you! I love the Lowe's creative ideas magazine. The projects are all do-able and cute. I would love to be able to spend 75 dollars in Lowe's ! I would love a gift card. And that is a really cute pine come and candle craft. Looks so easy! Oh my, the projects to come with Lowe's! Thanks for the chance to win! Oh how I'd love this! We are building a new house and I have so many decorating projects planned! What a great last-minute idea for a centerpiece! I absolutely love this centerpiece. I am always looking for something quick I can make and use for more than just the holidays and I think this would be perfect. Thanks for sharing with us your process.